Over the course of the next Assembly, an estimated 26,000 children in Wales, including 10,000 of the poorest children, are at risk of leaving primary school unable to read well, if action isn’t taken. Volunteering Matters develops and delivers high impact volunteer led solutions across the UK in response to some of the most difficult challenges facing individuals and their communities today. Our Learn Together Cymru project harnesses the power of volunteers who give their time to help children and young people one-to-one with their reading, maths, languages or other subjects and activities, in schools and in family and community learning settings across Wales. These new figures released today by the Read On. Get On. Campaign, which Volunteering Matters are a part of highlight that decisive action must be taken over the course of the next Welsh Assembly to allow children, particularly those from low income homes, to fulfil their potential. The coalition is urging every political party, ahead of May’s Welsh Assembly Elections, to sign up to their ambitious goal to get every child reading well by the time they finish primary school, by 2025. 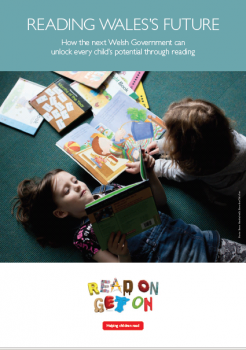 The group has launched their research Reading Wales’ Future English, highlighting that without increased action to get all children reading well, it will make it harder to close the attainment gap. It will mean that children, particularly those who grow up in poverty, will face barriers at every stage in their education, with serious knock on effects for their future prospects. “School leaders fully understand the importance of reading as an essential skill to succeed in life. As well as opening up a world of opportunities to children from every background, reading should also be a pleasure in its own right.